Responsive design is the web designer’s latest tool to create a website that can dynamically change its layout, navigation, and content based on the user’s display. For the website owner it means not having to maintain different websites for desktop, tablets, and smartphones. For the user it means a smooth and pleasant experience no matter what device is used to access the site. Do people really surf the web on their smartphone? “Never leave home without it” – that’s the way most smartphone users think about their device. A Google study found that 9 out of 10 smartphone searches result in an action (a purchase, going to the business location, etc.). Up until a short while ago web surfers were satisfied with a user-friendly website they accessed from their desktop or laptop computer, but that’s no longer the case. Now visitors expect a well functioning site that also looks good across a variety of devices. If they’re viewing your business website from a tablet or smartphone they want to experience the same ease of use just as if they’re browsing on their desktop computer. Your business could lose sales if your site is not mobile-friendly. 72 percent of consumers expect brands to have a mobile-friendy website, according to a Google study entitled “What Users Want Most From Mobile Sites.” 52 percent of the study participants said a bad mobile experience made them less likely to contact the business. 48 percent said that if a site didn’t work well on their smartphones they felt the company didn’t care about doing business with them. 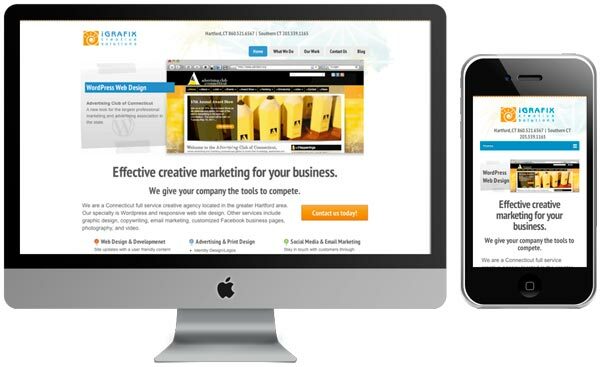 Factor a website redesign into your marketing budget, you really can’t afford not to. Call us at 860-521-6567 if you have questions about responsive web design or if you’re ready to make the move to a responsive website. I had no idea that so many people are using their phone to get online. If you’re local – our studio is located in Collinsville. Just give us a call to set up an appointment. Hope to see you soon. good info. Makes me think about getting my website redone.